Originally written in 2013, this is the final chapter in a three-part installment on Christopher Columbus beginning with The Other Explorers and Hunting Prestor John in the End Times. 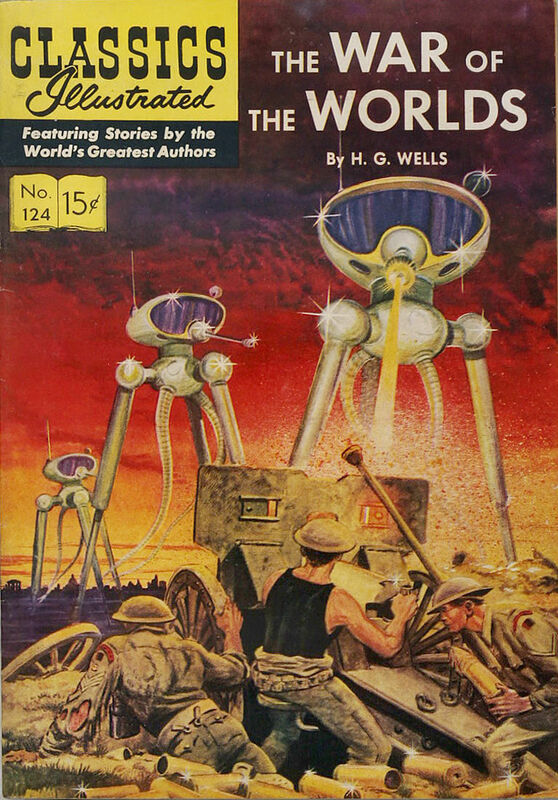 This post ponders how the destruction of the Americas, and the accompanying legacies of colonialism and slavery, help shape the fears of our popular imaginings–including science fiction. This year, over 8 cities abolished Columbus Day. Many in fact adopted Indigenous Peoples Day’ as a replacement. The move reflects a growing acknowledgement by larger society of the meaning and historical legacy of Christopher Columbus and “Age of Exploration.” It’s a victory, albeit a minor one. History of course can move backwards as well as forwards. And there are those forces who are determined to keep Columbus as a transnational hero: to give a one-sided perspective–often apologist–of the era. The truth is that the abolishing of a commemoration can’t possibly erase the enormity of the crimes of which Columbus will forever remain a symbol. He is a part of our latent fears. The ones that we fill our stories with as we look out upon the stars. 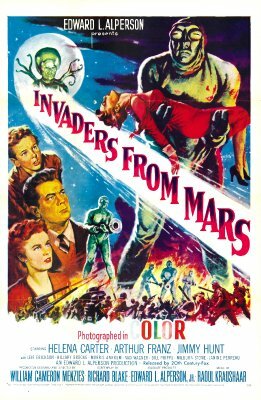 He is our original invader from Mars. “If aliens visit us, the outcome would be much as when Columbus landed in America, which didn’t turn out well for the Native Americans. . . We only have to look at ourselves to see how intelligent life might develop into something we wouldn’t want to meet.”–physicist Stephen Hawkins. On August 3, 1492, Christopher Columbus had reason to celebrate. Having finally convinced the Aragon-Castille court (eager to catch up with the rival Portuguese) that he could find an alternate ocean route to the East, where wealth and the fabled Prester John were waiting, the young mariner and fervent believer in the imminent Apocalypse, set out with three ships to cross the Atlantic. After about a month, he made landfall on several islands, one of which he would name Hispaniola–modern-day Haiti and the Dominican Republic. Believing his gamble had proven correct, he was certain he had reached India and upon greeting the inhabitants began to inquire where he could find the Khan. Of course, Columbus was nowhere near India, or the court of the Yuan (Mongol) China Kublai Khan described by Marco Polo some two centuries earlier. The world was much larger than he understood. His calculations had been off, much as the skeptical Portuguese he had first approached to finance his voyage claimed. What neither he, nor they, of course knew was that two great landmasses–later termed North and South America–and a set of accompanying islands, sat in the Atlantic between Europe and Asia. The varied people he met on Hispaniola were not “Indians,” but a people called Tainos–one of the many indigenous groups, who numbered in the millions, who called this hemisphere home. And just like that, the fate of the indigenous people of the Americas was decided. Columbus, acting on the precedent set by the Reconquista and crusading ideologies, had set forth the justification by which their lands, resources and bodies had all been claimed, quite justly he believed, for Christian Spain. Plans to ship the indigenous population to Europe in an early trans-Atlantic slave trade didn’t pan out. There was no large-scale market for slave labor back in Spain. And those who were sent, often didn’t survive the voyage. In 1495, some two-hundred died before they even arrived in Spain; their bodies were cast into the sea. 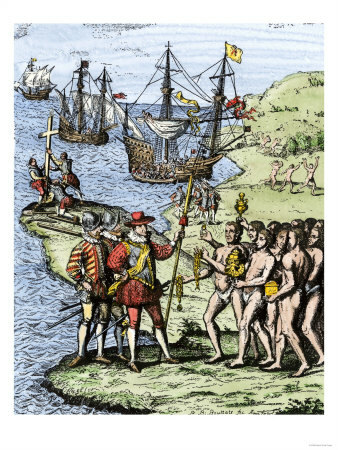 But on the islands, they provided a ready labor supply–for the mining of gold and silver, which Columbus and his men quickly noticed adorned their bodies in small amounts. 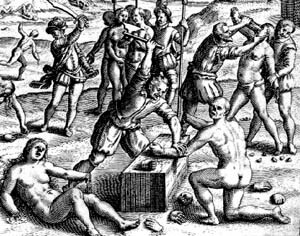 The Tainos soon found themselves in forced labor camps, panning for precious metals eagerly desired by the Spanish. Columbus maintained a strict discipline regime, setting up a tribute system that required every Taino over the age of 14 to fill a small bell full of gold, or, if there was little gold, 25 pounds of spun cotton. Disobedience or inability to meet the quota was dealt with harshly–either through amputation of hands, or the cutting off of noses or ears. …we ask … that you acknowledge the Church as the Ruler and Superior of the whole world, and the high priest called Pope, and in his name the King and Queen Doña Juana our lords, in his place, as superiors and lords and kings of these islands….If you do so, you will do well . . . and we . . . shall receive you in all love and charity, and shall leave you, your wives, and your children, and your lands, free without servitude . . . .But, if you do not . . . and maliciously make delay in it, I certify to you that, with the help of God, we shall powerfully enter into your country, and shall make war against you in all ways and manners that we can, and shall subject you to the yoke and obedience of the Church and of their Highnesses; we shall take you and your wives and your children, and shall make slaves of them, and as such shall sell and dispose of them as their Highnesses may command; and we shall take away your goods, and shall do you all the mischief and damage that we can . . . and we protest that the deaths and losses which shall accrue from this are your fault . . . .
All of this rapidly took its toll on the local population. Most devastating, after being separated from the “Old World” for over 15,000 years, they lacked immunities to numerous diseases brought from Europe. The death rate was so high, for some Spanish it seemed as if the indigenous population was “evaporating” before their eyes. Some priests, startled at the decimation of the populace they were seeking to convert, began to voice dissent.
. . . the Christians [Spaniards], with their horses and swords and pikes began to carry out massacres and strange cruelties against them. They attacked the towns and spared neither the children nor the aged nor pregnant women nor women in childbed, not only stabbing them and dismembering them but cutting them to pieces as if dealing with sheep in the slaughter house. They laid bets as to who, with one stroke of the sword, could split a man in two or could cut off his head or spill out his entrails with a single stroke of the pike. They took infants from their mothers’ breasts, snatching them by the legs and pitching them headfirst against the crags or snatched them by the arms and threw them into the rivers, roaring with laughter and saying as the babies fell into the water, “Boil there, you offspring of the devil!” Other infants they put to the sword along with their mothers and anyone else who happened to be nearby. They made some low wide gallows on which the hanged victim’s feet almost touched the ground, stringing up their victims in lots of thirteen, in memory of Our Redeemer and His twelve Apostles, then set burning wood at their feet and thus burned them alive. Las Casas’s accounts would disturb even the Inquisition backers back in Spain, and eventually led to calls for restrictions on Spanish excesses. But much of this was with a wink and a nod, and too little too late. Even before Las Casa’s account, the mainland empires of the Aztecs and the Incans had fallen to the Spanish–sending back vast sums of gold and silver to fill the coffers of the increasingly powerful Spanish-Habsburg fiscal-military state, then locked in a staunch rivalry with the Ottomans. Within less than a century, the decimation of the indigenous population through (most notably) disease alongside warfare, greatly reduced a much-needed labor supply for the Spanish. Numbers are always hard to verify, but taking the low-end figure of a population of 30 million in 1500, it had been reduced to a mere 8 million by 1650. On some islands, the indigenous population vanished altogether. Those who did not die, fled–going to other islands or disappearing into the rainforests to escape Spanish slavers. 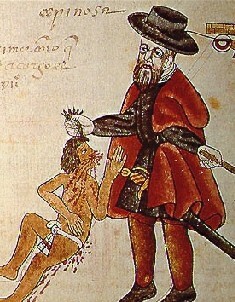 Spanish landowner and indigenous slave, encomienda system. And of course, many fought back. The Caribs especially, with a much more militaristic society, held off and defeated Spanish war bands–who began to roam the Caribbean basin seeking slaves. Taino leaders like Hatuey and Anacaona (a woman chief) openly revolted against the Spanish, and led short-lived guerrilla wars before being executed–Hatuey burned at the stake, Anacaona hanged. 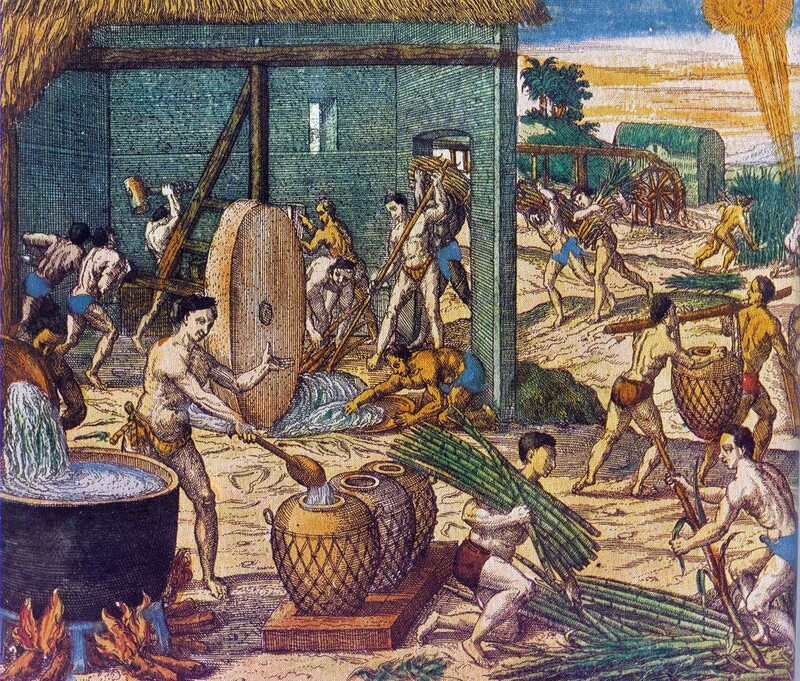 And with the conversion of many of the remaining indigenous people to Christianity, many could now assert (to varying degrees) their right to not be enslaved under the doctrine of “just war.” This loss in a ready labor supply became problematic for the Spanish, especially with the introduction of a new product that was increasingly becoming quite lucrative–sugar. Sugar had been introduced to western Europeans through the Crusades and contact with the Muslim world, who themselves had received it through India and China. It filtered to the Mediterranean, where Italian-city states grew cane, harvested and sent out sugar to much of the European world–who craved it. All of this became jeopardized in 1453, with the fall of Constantinople. Not only were the Mediterranean seas now dangerous for Christian sailors, but the vital Black Sea slave ports–which had carried on the long-standing slave trade in Slavs and other Eastern Europeans–were now blocked. So too was the trade in timber, vital to fueling the massive boilers that reduced cane juice to molasses. Genoese and Venetian financiers, finding their lucrative Mediterranean sugar plantations both in dangerous territory, without a ready labor supply or the needed products to make them profitable, made alliances with the Spanish and Portuguese to move this sugar complex to the Atlantic. It arrived first on the Canary islands near Spain and North Africa, where local Berber populations soon found themselves enslaved to produce sugar. With the threat of the Ottomans removed, the crop flourished. And as Portuguese explorers began to sail down West and Central Africa (in part searching for a route to the legendary Prester John), they established plantations on numerous islands–with the approval of nearby African polities, who (unlike the indigenous populations of the Americas) were susceptible neither to disease or steel, and whose centralized states could field large armies to challenge Europeans. As the sugar plantations moved down the African coast, the labor to work them began to resemble the people from the nearby mainland–who Europeans gained through trade with varied African states. By 1500 the sugar produced here skyrocketed, shooting past anything formerly produced in the Mediterranean, and providing such a surplus it was now being sold to the Muslim world. Columbus, who had been married to the daughter of a wealthy sugar plantation owner in the Atlantic, noticed almost immediately the possibility of sugar cane planting in places like Hispaniola. He would never get a chance to test his theory, but his son would–sending colonists to begin sugar plantations on the Spanish isle of Jamaica by 1509. This first attempt didn’t last long, but in the decades to follow sugar production in the accommodating climate of the Caribbean eventually grew. The first supply of labor would be the indigenous populations. But as they increasingly diminished from disease and warfare, a new supply was sought out–one that had proven useful on the other side of the Atlantic. The switch from indigenous to African labor wasn’t instantaneous. In fact, at first it was disliked. Some feared coastal West and Central Africans, long accustomed to European weaponry and the use of steel, would prove a more rebellious workforce. Others bemoaned the Africans were likely Muslims, and would bring the rival religion among the indigenous population. But others saw benefits. Atlantic Africans had been skilled in sugar production; they would be a trained labor force. They had little knowledge of this new geography, making escape less likely. And a system for procuring them through trade with African states was already established. No less than Las Casas, arguing (wrongly) that indigenous people were weaker, thus explaining their decimation, suggested the use of African slaves–who he saw (again, wrongly) as naturally stronger. It was something he would come to regret, as the trade in African slaves grew exponentially with the rise of sugar production; he would spend the latter third of his life, making one of the earliest calls for the end of the African slave trade. However, the die had been cast. What had begun as part of a Muslim-Christian state rivalry, the need to seek out new trade routes, Apocalyptic religious fervor and plain greed, had created entirely new societies–ushering in the decimation of the indigenous people of the Americas, colonialism, African slavery, racism and the other more unsavory defining elements of the modern age. When the former slave turned general and liberator Jean-Jacques Dessalines completed his routing of Napoleon Bonaparte’s troops, pronouncing the French colony of St. Domingue an independent free black republic, he famously declared, “I have avenged America!” Dessalines remarks were birthed out of the heady ideals of modernity, but as well the destruction modernity had wrought. 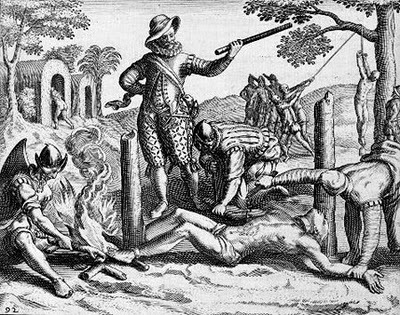 The vengeance he cried out was for the indigenous people of the Americas, and his own Hispaniola. “I have avenged America!” was a repudiation of the decimation of millions of indigenous lives and the enslavement of millions more from Africa, through whose blood and toil the modern world and European ascendancy had been born. Dessalines and his victorious black armies (who interestingly named themselves the “Indigenous Army”) not only went on to create the first Constitution outlawing slavery forever (it took Britain 30 more years, the United States another 60 years and Brazil another 80), they also renamed St. Domingue. The name they chose was claimed to have come from the disappeared indigenous population Columbus had encountered some three hundred years prior–Haiti. But that singular act of defiance could not erase Christopher Columbus from our memories. His presence looms large over us even today, as the legacies of that encounter in 1492 remain reflected in our popular imaginings. In science fiction, this meme has been more than common–it’s become a staple. 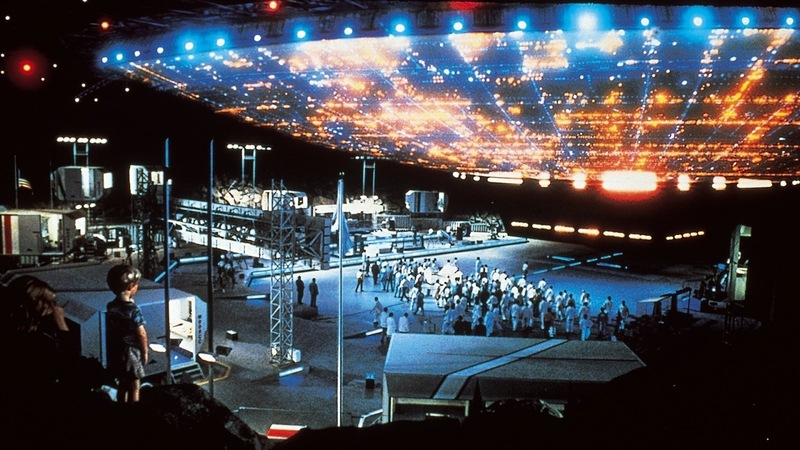 The alien invasion scenario, in which, like Columbus, some extra-terrestrial force arrives and conquers the Earth in a wave of “genocide” and colonialism, fills our primal sci-fi imaginations. H.G. Wells remains one of the progenitors of this genre. His work War of the Worlds in 1898, which told of a devastating Martian invasion, was likely based more so on the new age of colonialism and imperialism that had ushered in the late 19th century–from India to the “scramble” for Africa. But this new colonialism had been given birth by the one Columbus set forth three hundred years past. In fact, it could be argued that the ascendancy of Western Europe was directly tied to those events that began in 1492–generating wealth that would grow whole Empires and fund revolutionary inventions, like the steam engine. The fears in the West, of being conquered and enslaved (or wiped out) by some space-borne imperialist who rationalizes their colonial aspirations with the same cold calculations of Columbus, fills science-fiction. From those unnamed city-destroying aliens in Independence Day who only want us to “die,” to the cannibal Kanamits (it’s a cookbook!) to even the enslaving Borg, nothing terrifies us so much as, in Well’s words, those possible “intellects vast and cool and unsympathetic” who might gaze at our world “with envious eyes,” while “slowly and surely” plotting our conquest. In our fears, and bits of guilt reversal, we’ve even created stories where we–the humans–are the invasive Columbus of the future, of some new indigenous population. This is probably best seen in James Cameron’s Avatar, only we manage to put in a noble heroic “white-savior figure” to curb our guilt; too bad the Tainos didn’t have one. It was interesting to hear people cheer on the innocent “noble-savage” blue-skinned Afro-Indigenous Na’vi, as if given a time machine, they would actually return as some turn-coat Conquistador or Pilgrim and help the indigenous population repel the greedy European invaders. I wondered how many were honestly prepared to deal with the “butterfly effects” of such actions. …even as the Europeans admired the Indians’ simplicity, they were troubled by it, troubled and offended. Innocence never fails to offend, never fails to invite attack, and the Indians seemed the most innocent people anyone had ever seen. Without the help of Christianity or of civilization, they had attained virtues that Europeans liked to think of as the proper outcome of Christianity and civilization. The fury with which the Spaniards assaulted the Arawaks even after they had enslaved them must surely have been in part a blind impulse to crush an innocence that seemed to deny the Europeans’ cherished assumption of their own civilized, Christian superiority over naked, heathen barbarians. . . . Before we become too outraged at the behavior of Columbus and his followers, before we identify ourselves too easily with the lovable Arawaks, we have to ask whether we could really get along without greed and everything that goes with it. But of course, “first contact” doesn’t have to be that way…does it? In Gene Roddenberry’s Star Trek universe, thankfully the Vulcans aren’t stopping by to conquer and enslave us to logic. Steven Barnes’s alternative history Lion’s Blood, takes a moderate approach–where African Muslim contact with the Americas results in expansion, but Native Americans hold on to vast swaths of land; a flourishing Aztec Empire seems to hold most of Mexico and beyond; while a relatively nobody named Christopher Columbus drowns without notice in a bathhouse. Stephen Baxter’s short “The Unblinking Eye” flips the entire notion of exploration on its head, where a technologically advanced Inca Empire crosses the Atlantic by steam-powered ship to make first contact with a landlocked, superstitious Europe. Many deflect–pointing out human beings always conquer. How can we today be held to any responsibility for what happened in the past? But deep down, I think we all know. It has to strike us at some moment, that awful truth that we try to sweep away. It’s almost as if Columbus Day exists because if we didn’t celebrate this figure and his legacy as a triumph, we would be forced to acknowledge and peer into the abyss. And there’s no real way to atone for it is there? No amount of apologies or reparations could possibly erase this moral debt. So instead, maybe that’s why we create imaginative stories, of alien conquistadores, descending from the skies, toppling our built-up “civilizations” and erasing us from existence. Who knows, centuries later, our new alien overlords will construct monuments and holidays to their own noble explorers, and create stories of even more fearsome galactic beings than themselves, as a way to deal with their own guilt and inner fears. This entry was posted in Uncategorized and tagged Africa, Bartolome De La Casas, Christopher Columbus, colonialism, Destruction of the Indies, Explorers, H.G. Wells, Just War, Native Americans, Slavery, Tainos by The Disgruntled Haradrim. Bookmark the permalink. It’s messed up we give him a holiday. “Jack Forbes, who was a Professor of Native American Studies at UC Davis, wrote in his book Native Americans of California and Nevada that what people discount when they start talking about “Indians died of diseases” is that Native people had been living in organized cultures and societies for thousands upon thousands of years. They had lived through epidemics before and their oral stories support this. They had developed medicine, surgery, psychology, and many other practices meant to keep them healthy. They had ways of addressing things like the flu, or small pox or other diseases that for some reason when we learn about them in history class become unstoppable epidemics. “Because that’s the implication right? It’s just that Native peoples immune systems were so weak and the super strong Europeans who had the antibodies they needed, they could survive. But Native peoples who were so (primitive? different? weak?) just couldn’t handle the super duper European disease. a profound point. certainly whatever the impact of disease, it was compounded and exacerbated by warfare and enslavement.